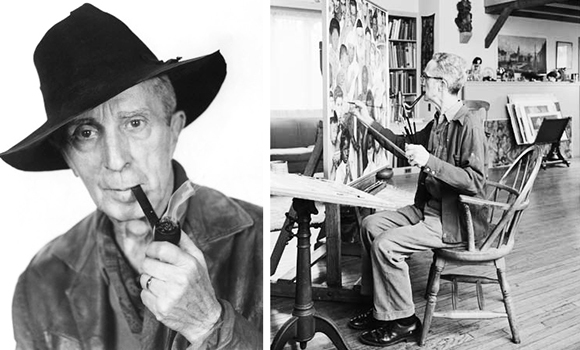 Happy Birthday to iconic American painter Norman Rockwell (1894-1978), best known for his 322 Saturday Evening Post covers depicting humorous, often touching scenes of everyday life. I’m continuing my “birthday clock” series. 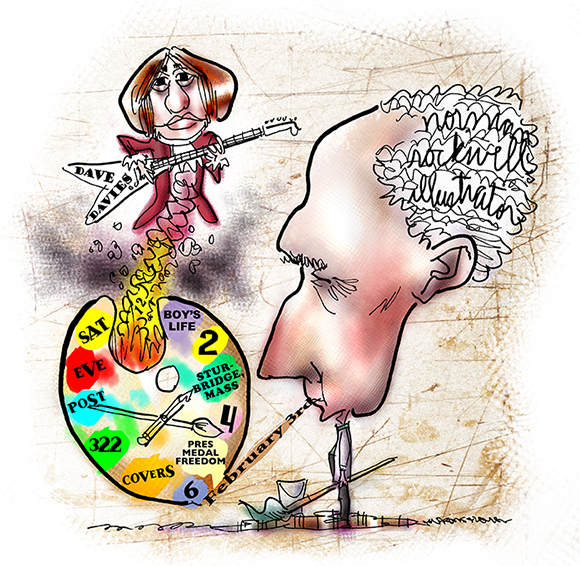 I include a clock in each illustration, and use it to convey information about the honoree. Who’s that wafting up out of Norm’s palette pipe? Why, none other than Dave Davies, lead guitarist for British band the Kinks, perhaps best remembered for his manic guitar work on the band’s first big hit, You Really Got Me. Dave shares a February 3rd birthday with Mr. Rockwell. My tribute contains a painful and glaring error, which I only discovered as I was writing this post. I debated whether to bang my head on the wall or laugh, then decided to do both and issue this challenge: Can you spot the error, Dear Reader? Answer at end of post. In researching his life, I was astounded to learn that Norman Rockwell once had a bit part in a movie: the 1966 remake of Stagecoach, which starred Alex Cord in the role first made famous by John Wayne. Rockwell played a townsman. He’s shown in character for the part, below left. On right: painting in his studio, date unknown. Rockwell did many self-portraits. The one shown below was unfamiliar to me. I think it’s one of his best. It shows him painting The Soda Jerk, one of his famous Saturday Evening Post covers (1953). OK, what was the error? Rockwell moved to Stockbridge, Massachusetts in 1953, and spent the rest of his life there. The Norman Rockwell Museum is also in Stockbridge. I’ve been there, and can highly recommend it. What do you think? 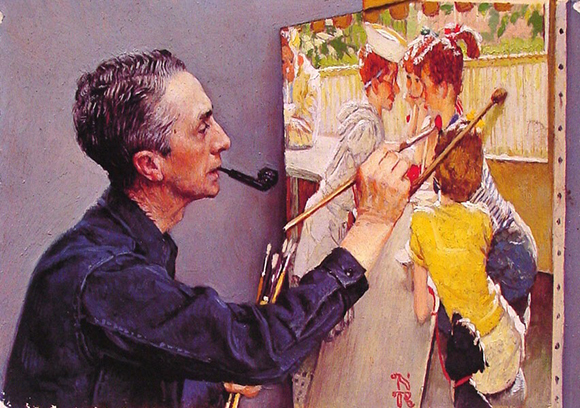 Are you a Norman Rockwell fan? 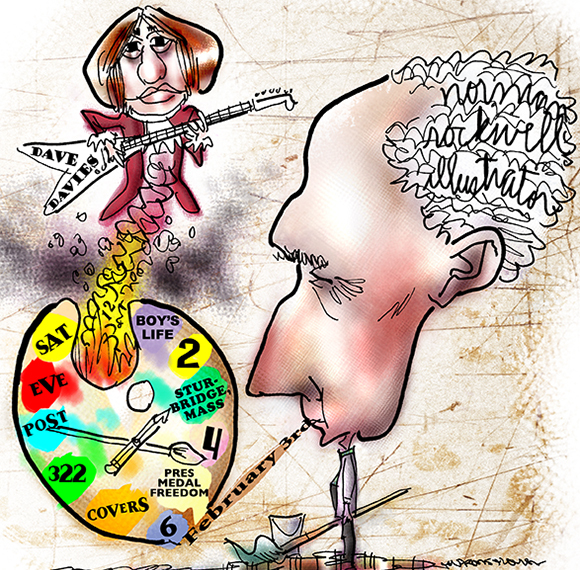 Does anyone remember Dave Davies and The Kinks? Hope you’ll leave a comment. Woolly Bully! Calling All Sheep! Oh, you captured him so well! and Dave Davies looks dandy! Wonderful tribute!!! I esp love the energy in this one! It’s moving! AND the the way you put words in Mr. Rockwell’s hair is brilliant! Thanks for your kind, energetic, and good rockin’ support! No, but Boy’s or Boys’ was good for second prize! I know nothing about the two of them but I know the song You Really Got Me. That sounds appropriate regarding Dave Davies, doesn’t it? LOL. Thanks very much for your article, Mark! No, it wasn’t your mistake. It was my fault that I didn’t read it carefully about Stockbridge and Sturbridge 😀 . I love how Norman Rockwell captured America of that era in paint. When I see his paintings, I can’t help but, smile. Nice tribute. Same here, I was always a big fan. I read somewhere that certain critics tried to express their disdain by referring to him as an illustrator, rather than a painter– but that Rockwell took no offense, since “illustrator” was how he referred to himself. I find that very cool (and reassuring!). I love Norman Rockwell’s work! Takes me back to a more innocent time. Dolly sent me over to check out your site and I’m so glad she did. You are a talented guy! And a fantastic site! Thanks again for your good humor and kind comment! Perhaps I should have included a dog or cat in my Norm tribute. Seems he often did in his paintings, which is why I’m predicting you’ll be picking up a NR collection at an old bookstore one of these days… always good to see you, Amelie!